ESA – European Society for Agronomy, an open forum for basic and applied sciences in agronomy. Started in 1992, the European Journal of Agronomy is the official journal of the European Society for Agronomy. It is published by Elsevier Science and it is abstracted into several publications such as Field Crop Abstracts (CAB). The EJA has just seen in 2015 a big rise in its citation index (Journal Metrics). This bears out our editorial policy of giving priority to publishing high quality papers in the EJA. The EJA is now 8th out of 83 in the IF rankings for agronomy – but this includes many journals that are tangential to agronomy as a discipline or only publish review papers on an annual basis. The EJA is the highest ranked multi-issue agronomy journal in the world and merits fully its sub-title as ‘A Global Agronomy Journal’. All members of the ESA who have contributed to this ongoing achievement with our journal should be proud and also be thanked for their efforts. It is very important that ESA members give priority both to sending high quality papers to the EJA and to accepting to review papers from the EJA now and in the future. 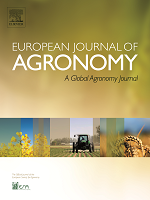 The European Journal of Agronomy publishes original research papers reporting experimental and theoretical contributions to field-based agronomy and crop science. The journal will consider research at the field level for agricultural, horticultural and tree crops that uses comprehensive and explanatory approaches. One of the things that makes the journal such as success is the hard work of the editorial team led by the Editors-in-Chief: John Porter, Olaf Christen, Antonio Delgado and Francisco Villalobos (See http://www.journals.elsevier.com/european-journal-of-agronomy/editorial-board/for full details). In determining the suitability of submitted articles for publication, particular scrutiny will be placed on the degree of novelty and significance of the research and the extent to which it adds to existing knowledge in agronomy. #6 – June 2012: Gaydon, D.S., Probert, M.E., Buresh, R.J., Meinke, H., Suriadi, A.., Dobermann, A., Bouman, B.A.M., Timsina, J., 2012. / EJA 39, 9-24. # 2 – October 2011: Lopez-Lozano, F. Baret, I.García de CortázarAtauri, E. Lebon and B. Tisseyre, 2011. EJA 35(3): 171-183. # 1 – September 2011: Basso B et al (2011) EJA 35, 83-92. Economic and environmental evaluation of site-specific tillage in a maize crop in NE.